(Mostly) healthy, (mostly) vegetarian cooking. Nearly all set to go! 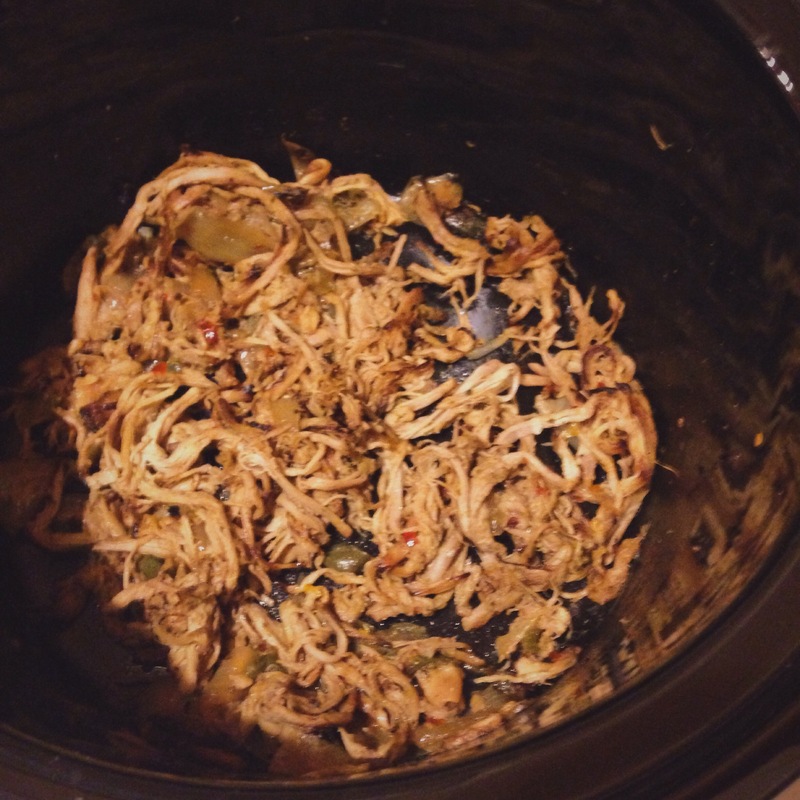 I have become somewhat obsessed with our slow cooker recently, and this recipe for pulled pork tacos is SO DAMN EASY. AND SO DAMN GOOD. It is definitely set for high rotation, especially as it gets colder out. More traditional recipes for Pork Carnitas call for pork shoulder or other similarly fatty cuts, but I prefer using a healthier, leaner cut of meat – trust me, it will still blow your mind. And decreased calories means more servings with less of the guilts! A few minutes under the grill at the end of cooking will crisp up the edges deliciously, but this is totally optional. This recipe will serve four comfortably, but if you love these as much as we do you might want to up the quantities somewhat. I adapted this recipe from here and here. Combine chilli flakes, cumin, oregano, salt and pepper in a shallow bowl. Rub pork loin with extra olive oil and then season with the spice mixture, rubbing in thoroughly (ensure all spice mixture is used – just whack any that doesn’t stick to the pork into the pot with everything else). 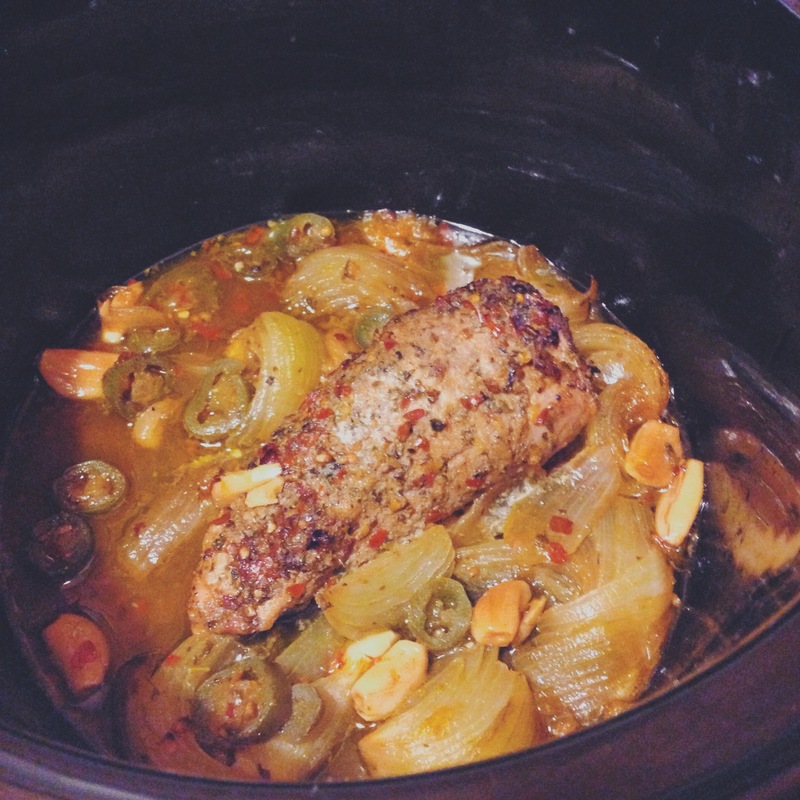 Place garlic, onions, jalapeños, orange juice, lime juice, zest, olive oil and seasoned loin into a slow cooker. Cover and cook on low heat for 8 hours or high for 4-5 hours. Remove pork shoulder from the slow cooker and shred the meat before returning to the pot with the juices; season with salt and pepper, to taste, if needed. Cover and keep warm for an additional 30 minutes. add a little water if needed. Preheat your oven to grill. Place carnitas (minus liquid etc) onto a baking sheet and grill for a couple of minutes until slightly browned in parts. Place back into liquid and stir before serving. (Optional, but YUM). Serve in small corn tacos with a little bit of cheese, sour cream, homemade pickled red onions, coriander, tomato and red onion salsa and grated zucchini. Also good with lettuce, refried beans etc. Anything you like really!